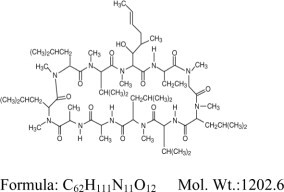 Blood cyclosporin A concentrations were measured using a specific high pressure liquid chromatography-mass spectrometry assay. Blood concentrations of cyclosporine, in all the samples collected, after topical administration of RESTASIS® 0.05%, BID, in humans for up to 12 months, were below the quantitation limit of 0.1 ng/mL. There was no detectable drug accumulation in blood during 12 months of treatment with RESTASIS® ophthalmic emulsion. Four multicenter, randomized, adequate and well-controlled clinical studies were performed in approximately 1200 patients with moderate to severe keratoconjunctivitis sicca. RESTASIS® demonstrated statistically significant increases in Schirmer wetting of 10 mm versus vehicle at six months in patients whose tear production was presumed to be suppressed due to ocular inflammation. This effect was seen in approximately 15% of RESTASIS® ophthalmic emulsion treated patients versus approximately 5% of vehicle treated patients. Increased tear production was not seen in patients currently taking topical anti-inflammatory drugs or using punctal plugs. RESTASIS® is contraindicated in patients with active ocular infections and in patients with known or suspected hypersensitivity to any of the ingredients in the formulation. RESTASIS® ophthalmic emulsion has not been studied in patients with a history of herpes keratitis. General: For ophthalmic use only. 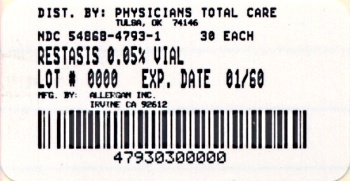 The emulsion from one individual single-use vial is to be used immediately after opening for administration to one or both eyes, and the remaining contents should be discarded immediately after administration. Do not allow the tip of the vial to touch the eye or any surface, as this may contaminate the emulsion. Systemic carcinogenicity studies were carried out in male and female mice and rats. In the 78-week oral (diet) mouse study, at doses of 1, 4, and 16 mg/kg/day, evidence of a statistically significant trend was found for lymphocytic lymphomas in females, and the incidence of hepatocellular carcinomas in mid-dose males significantly exceeded the control value. In the 24-month oral (diet) rat study, conducted at 0.5, 2, and 8 mg/kg/day, pancreatic islet cell adenomas significantly exceeded the control rate in the low dose level. The hepatocellular carcinomas and pancreatic islet cell adenomas were not dose related. The low doses in mice and rats are approximately 1000 and 500 times greater, respectively, than the daily human dose of one drop (28 Î¼L) of 0.05% RESTASIS® BID into each eye of a 60 kg person (0.001 mg/kg/day), assuming that the entire dose is absorbed. Cyclosporine has not been found mutagenic/genotoxic in the Ames Test, the V79-HGPRT Test, the micronucleus test in mice and Chinese hamsters, the chromosome-aberration tests in Chinese hamster bone-marrow, the mouse dominant lethal assay, and the DNA-repair test in sperm from treated mice. A study analyzing sister chromatid exchange (SCE) induction by cyclosporine using human lymphocytes in vitro gave indication of a positive effect (i.e., induction of SCE). No impairment in fertility was demonstrated in studies in male and female rats receiving oral doses of cyclosporine up to 15 mg/kg/day (approximately 15,000 times the human daily dose of 0.001 mg/kg/day) for 9 weeks (male) and 2 weeks (female) prior to mating. Teratogenic Effects: No evidence of teratogenicity was observed in rats or rabbits receiving oral doses of cyclosporine up to 300 mg/kg/day during organogenesis. These doses in rats and rabbits are approximately 300,000 times greater than the daily human dose of one drop (28 Î¼L) 0.05% RESTASIS® BID into each eye of a 60 kg person (0.001mg/kg/day), assuming that the entire dose is absorbed. Non-Teratogenic Effects: Adverse effects were seen in reproduction studies in rats and rabbits only at dose levels toxic to dams. At toxic doses (rats at 30 mg/kg/day and rabbits at 100 mg/kg/day), cyclosporine oral solution, USP, was embryo- and fetotoxic as indicated by increased pre- and postnatal mortality and reduced fetal weight together with related skeletal retardations. These doses are 30,000 and 100,000 times greater, respectively than the daily human dose of one drop (28 Î¼L) of 0.05% RESTASIS® BID into each eye of a 60 kg person (0.001 mg/kg/day), assuming that the entire dose is absorbed. No evidence of embryofetal toxicity was observed in rats or rabbits receiving cyclosporine at oral doses up to 17 mg/kg/day or 30 mg/kg/day, respectively, during organogenesis. These doses in rats and rabbits are approximately 17,000 and 30,000 times greater, respectively, than the daily human dose. Offspring of rats receiving a 45 mg/kg/day oral dose of cyclosporine from Day 15 of pregnancy until Day 21 postpartum, a maternally toxic level, exhibited an increase in postnatal mortality; this dose is 45,000 times greater than the daily human topical dose, 0.001 mg/kg/day, assuming that the entire dose is absorbed. No adverse events were observed at oral doses up to 15 mg/kg/day (15,000 times greater than the daily human dose). There are no adequate and well-controlled studies of RESTASIS® in pregnant women. RESTASIS® should be administered to a pregnant woman only if clearly needed. Cyclosporine is known to be excreted in human milk following systemic administration but excretion in human milk after topical treatment has not been investigated. Although blood concentrations are undetectable after topical administration of RESTASIS® ophthalmic emulsion, caution should be exercised when RESTASIS® is administered to a nursing woman. The safety and efficacy of RESTASIS® ophthalmic emulsion have not been established in pediatric patients below the age of 16. The most common adverse event following the use of RESTASIS® was ocular burning (17%). Other events reported in 1% to 5% of patients included conjunctival hyperemia, discharge, epiphora, eye pain, foreign body sensation, pruritus, stinging, and visual disturbance (most often blurring). Invert the unit dose vial a few times to obtain a uniform, white, opaque emulsion before using. Instill one drop of RESTASIS® ophthalmic emulsion twice a day in each eye approximately 12 hours apart. RESTASIS® can be used concomitantly with artificial tears, allowing a 15 minute interval between products. Discard vial immediately after use. RESTASIS® ophthalmic emulsion is packaged in single use vials. Each vial contains 0.4 mL fill in a 0.9 mL LDPE vial; 30 vials are packaged in a polypropylene tray with an aluminum peelable lid. The entire contents of each tray (30 vials) must be dispensed intact. RESTASIS® is also provided in a 60 count (2 x 30) package (one month supply) that must be dispensed intact. Storage: Store RESTASIS® ophthalmic emulsion at 15 - 25° C (59 - 77° F). Each mL contains: Active: cyclosporine 0.05% Inactives: glycerin; castor oil; polysorbate 80; carbomer copolymer type A; purified water; and sodium hydroxide to adjust the pH. Usual Dosage: Twice daily approximately 12 hours apart. Invert the vial before using. Use immediately after opening and then discard. Note: Store at 15 - 25° C (59 - 77° F). Store vials in the thermoformed tray until use. The entire contents of each package (60 vials) must be dispensed intact.